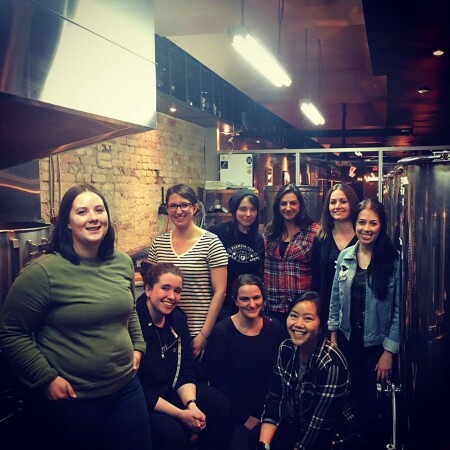 TORONTO, ON – Folly Brewpub has announced the release of the beer that was brewed on Saturday March 11th for the 2017 edition of International Women’s Collaboration Brew Day (ICWBD). Each year, organizers select a theme to tie beers brewed around the world with IWCBD. This year the theme was “Brew Local.” Ongoing was brewed using expressive Cashmere hops from McConkey Farms in St. George, Ontario and two different strains of yeast from Escarpment Labs in Guelph, Ontario. “The name of this beer comes from the ongoing conversation about women in the beer industry that the IWCBD alway inspires,” says Coady. Ongoing will be going on sale today (May 12th) in a limited run of 750 ml bottles in the Folly retail shop, and on tap in the brewpub. A portion of proceeds will be donated to Working Women Community Centre in Toronto.